Does my bundled Serato DJ software only work with the NS7III or can I use it with any other Numark controllers? If I'm on a Windows computer, do I have to install any additional drivers? Yes. If you're on a Windows computer, look at the sidebar on the right-hand side of this page. Under downloads, you will find both the Windows Audio Driver v1.0.0 and Windows Display Driver v1.0.0. Download and install both drivers. 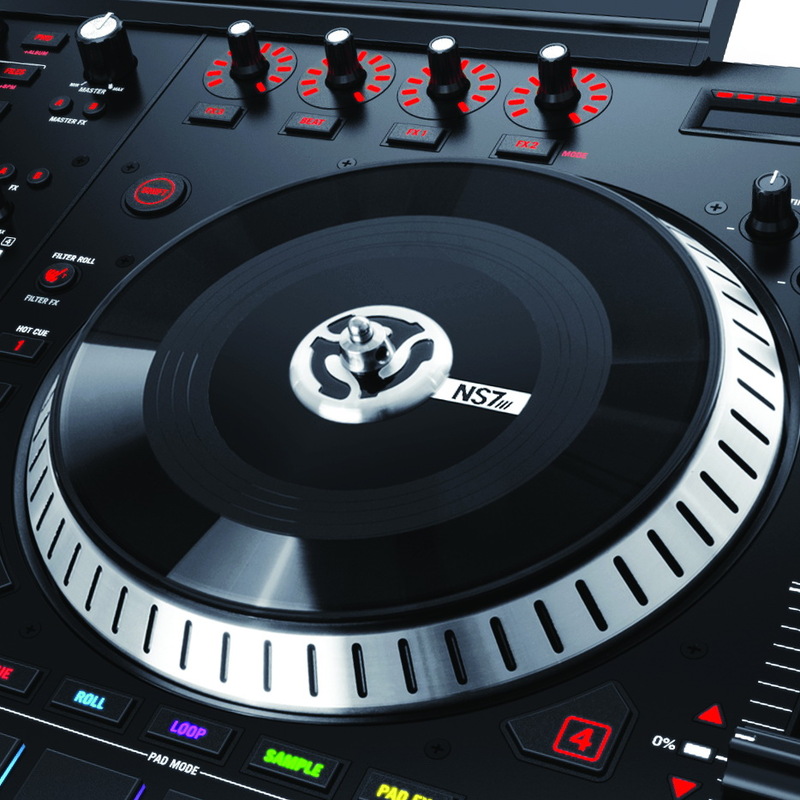 What DJ software is included with the NS7III? 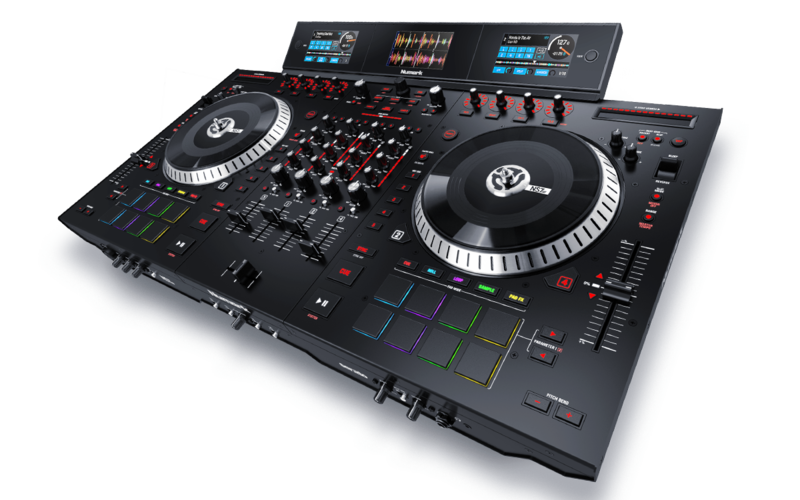 What DJ software supports the NS7III? The NS7III is a native plug & play Serato DJ controller. The NS7III may also work with other DJ programs as it is MIDI compatible however, your screens may not be supported. Can the motorized platters on the NS7III be disabled? Yes. The NS7III's motorized platters can be turned off by pressing the Shift + Slip Mode. How many effects are included with the Serato version shipping with the NS7III? Is the crossfader user replaceable? Yes. The CP-Pro long life crossfader is user replaceable. Crossfader Part No. TWPC07C04901 - Cross Fader PCB Assembly. Note: It's the same 2mm allen key as used with the NS7, NS7FX and NS7II to take apart the panel of the mixer. Where can I purchase a new crossfader? Are the platters on the NS7III belt driven or direct drive? The platters on the NS7III are direct drive. Direct drive is the industry standard for professional grade turntables. Are the drum pads velocity sensitive? Yes. The 16 MPC pads are velocity sensitive. Does the NS7III interface with an iPad or iPhone? The NS7III has external inputs on the rear that will allow you to connect any audio device such as a phone, tablet, or drum machine etc. Will the Vinyl records from the original NS7 and NS7II fit the NS7III? Yes. The original NS7 and NS7II Vinyl and spindle accessory will fit the NS7III. In order to use original NS7 and NS7II vinyl’s, you will need to use their original spindle and holder. What flight/travel case can I use to transport my NS7III? The NS7III and NS7II, without the display screens, will fit the original NS7 case. The original NS7 case will not fit the NS7III and NS7II with the attached display screens. There will be a new case that will come out for the NS7III and fit the attached display screens. Does the NS7III included an attached laptop stand like the original NS7 did? No, but it will include a display screen which will work for both the NS7II and NS7III. How do you download and get the Prime Loop Remix Tool Kit and TOOLROOM Artist Packs? After you register your NS7III at www.numark.com/my-account/login, the downloads for both pieces of software will be listed under your Registered Products section. I'm on a Mac computer, how do I download the driver? Since you’re on a Mac computer, your NS7III is class compliant! There are no additional drivers to install. Currently, only Windows users need to download and install an audio driver. Is the NS7III lighter than the NS7II and NS7? Yes! It’s actually 5 pounds lighter. Why aren't the four channels on the NS7III interchangeable in Serato DJ? 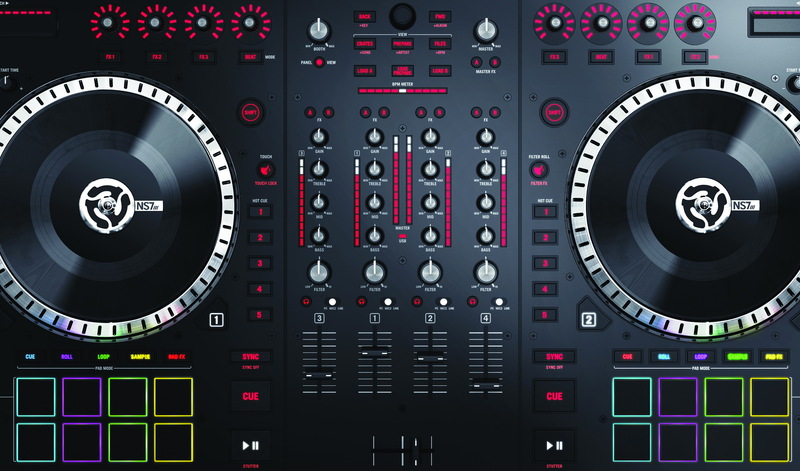 The NS7III in Serato DJ were developed to work seemingly together. The crossfader contour on the hardware accommodates separate line or phono inputs and allow you to adjust which software decks are being edited by the crossfader. The software's outputs on the NS7III specify what deck assignments are on the hardware. They are not interchangeable in the software, though you can edit crossfader assignment. When DJing with Serato DJ I can hear clicks and pops in my music. What can I do to fix this? Open a new finder window and navigate to Applications > Utilities. Double click Audio MIDI Setup. Select Window from the top menu and ensure that MIDI Studio is checked. With the NS7III disconnected, click the Numark USB Audio Device. Click Remove Device from the top of the MIDI Studio window. Under the drop down menu, select New Configuration. Type the name of your new configuration. Ex: Numark Controller. Click Setup from the top menu. Adjust the Display slider to 20 or 30. If you still experience clicks and pops after setting to 20UPS then try lowering the slider even lower. If you're on a Windows computer, adjust the audio slider to 512 or 1024. If you're on a Mac computer, adjust the audio slider to 10 or 20. If you still experience clicks, pops and dropouts then set your latency settings at the max setting of 1024 or 20. Is DVS supported with the NS7III? Yes! With the release of Serato DJ 1.7.7, both NS7III and NS7II users can now utilize Serato's DVS Expansion Pack. I've opened Serato DJ, my NS7III is connected to the DJ software but my platters are not moving nor is Slip Mode working correctly. What's going on? Recently Serato DJ has enabled DVS for both the NS7III and the NS7II. When you first start up your Serato software, you may already be on REL or ABS mode if you have DVS enabled. Simply navigate to your Vinyl Control Modes section for both decks and select INT for internal mode. If your using DVS, select either REL or ABS but for use without DVS, select INT mode.